Tea cup of porcelain. Decorated with golden shark's tooth banding. Cup, 2.25"T. Hand wash. Made in Portugal. Saucer sold separately. Hand-painted porcelain teacup and saucer. Holds 8 ounces. Hand wash. Made in Hungary. This is a special order pattern. If not in stock, please allow up to 4 months for creation and delivery. Sauvage salad plate. 6.7"Dia. 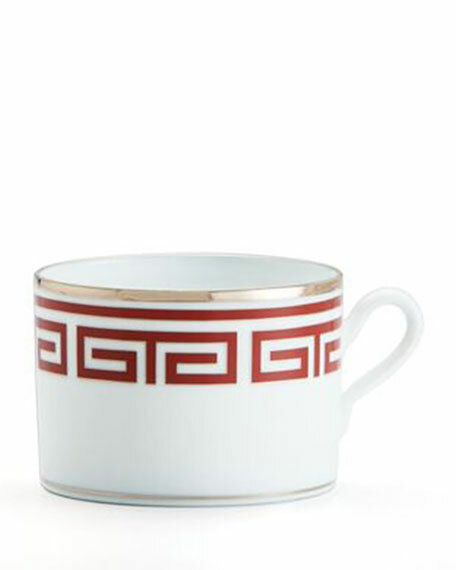 Crafted of Limoges porcelain with 24-karat gold detail. Hand wash. Made in France.